Ervin Pejo worked in an MGH anesthesiology research lab. Christopher M. Coburn sits in a roomy office atop one of Boston’s most prestigious addresses, the Prudential Center. But it’s the last place he wants to be. 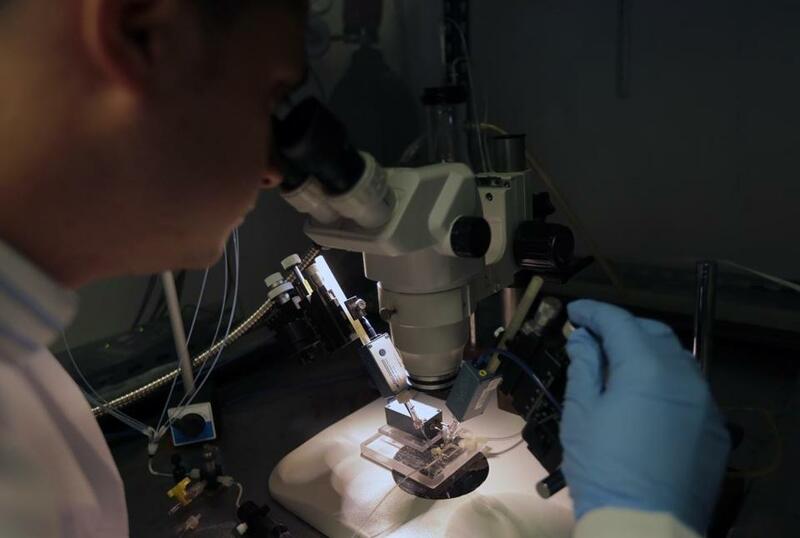 He would rather be at a biotech in Kendall Square, a research lab at Massachusetts General Hospital, or a dinner with a venture capitalist who is looking to invest in a promising technology. And whenever he can get to those places, he does. Coburn is vice president of innovation at Partners HealthCare, leading the charge by the state’s biggest health system to commercialize more of the technology that comes out of its prestigious teaching hospitals. His goal is to push Partners’ nearly $1.5 billion research operation to work more closely with biopharmaceutical and medical device companies, get drugs and treatments to patients more quickly, and double the $80 million that Partners earns from licensing agreements and spinoff companies. Partners is among the many hospitals, universities, and other institutions trying to expand partnerships with industry as federal funding for medical research wanes. Funding from the National Institutes of Health has fallen by about $1 billion since its peak of $31 billion in 2010. The agency provides nearly half of the research budget for Partners, which includes Massachusetts General and Brigham and Women’s hospitals. To further raise its profile and pave the way for new deals with companies, Partners on Monday kicked off the World Medical Innovation Forum, an event featuring big names like General Electric Co.’s chief executive, Jeffrey Immelt, and Ann Romney, wife of the former governor. But the increasing reliance on industry also raises concerns about the independence of scientific investigators and their ability to work on projects and share findings that companies may not like. Officials at Partners and other research hospitals concede they must walk a fine line when they enter into industry partnerships and remain vigilant in avoiding conflicts of interest. With an eye on declining federal funding, Partners executives started honing their focus on commercializing research about two years ago. They went looking for the best in the business; a headhunter came back with Chris Coburn’s name. Coburn, 58, founded the innovations office at Cleveland Clinic and led it for 13 years, helping to launch dozens of startups and sign deals that brought new revenue to that hospital. Before Coburn, Cleveland Clinic had never spun off its technology into a company. In Boston, Coburn leads an innovation office for an organization with five times the research budget of Cleveland Clinic. He has reorganized the Partners innovation office and its staff of about 80, creating teams that focus on commercializing treatments for orthopedics, surgery, radiology, and other fields. 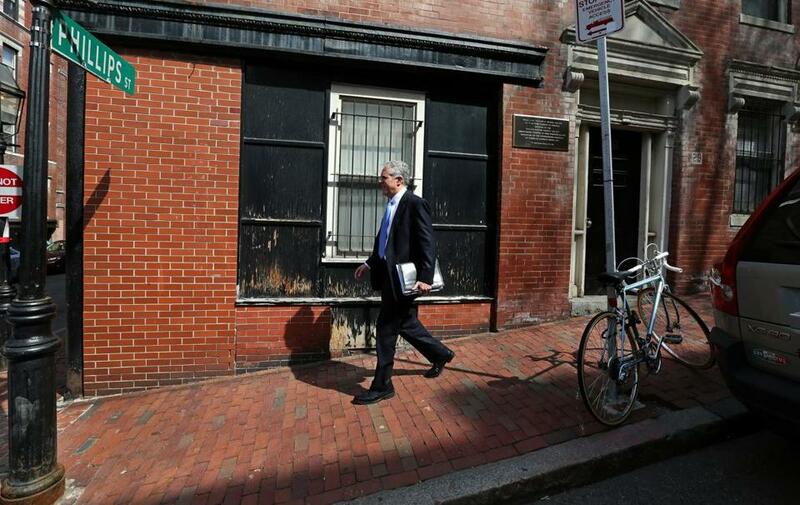 Chris Coburn, vice president of innovation at Partners HealthCare, walks to a meeting at Massachusetts General Hospital from his home on Beacon Hill. He has hired deputies with strong business backgrounds who know how to get deals done on time. “If you can’t do those on time, your level of trust in the industry is eroded,” Coburn said. He starts his days firing off e-mails before dawn, then moves around the city to meet with industry executives, Partners executives, potential investors, doctors, and scientists. He often does business over breakfast at the Paramount in Beacon Hill, around the corner from his home. Then he walks down the hill to Mass. General, or takes a cab to the Brigham, or Cambridge, or his office on Huntington Avenue. If he gets his way, though, he will leave the Back Bay and move his operation to Kendall Square, the hub for biotech and pharmaceutical companies. “We need to be in the middle of that,” he said. As much as he is trying to persuade the industry to do deals with Partners, he also is trying to persuade Partners researchers to work with industry. That requires a different way of thinking about research that does not come easily to scientists with little interest in the corporate world. “Changing any culture is incredibly hard,” said Dr. Anne Klibanski, the chief academic officer at Partners. The culture change is happening slowly, Klibanski said, through initiatives such as a speaking series in which successful researchers tell their peers how they advanced their projects by collaborating with industry. Partners also launched a $1 million grant program for promising research projects, to get staff excited about innovations that have commercial applications. Deals with industry take many forms but often start with agreements to license technology. Sometimes the ideas are strong enough to attract investors and turn into startup companies. Most new ideas for drugs and devices never make it to market, but when they are successful, the rewards can add up. An experimental drug developed by an anesthesiologist at Massachusetts General Hospital is one example. The drug, designed to put patients to sleep for surgery, was licensed to a startup called Annovation Biopharma. In February, Annovation was acquired by Medicines Co. of Parsippany, N.J. The sale earned $28 million for shareholders — including Partners — and includes up to $26 million in additional payments if the product reaches certain milestones. “It was very exciting, because a lot of times we do things in a lab, and we publish them in research journals, and it’s unclear how that new knowledge is going to help patients,” said Dr. Douglas Raines, whose lab developed the anesthesia drug. Raines acknowledged that as researchers work more closely with corporations, they must be careful about avoiding conflicts of interest. For example, Raines, as a full-time Mass. General researcher, could not have a managing role in the company he helped found. Despite such challenges, Partners is pushing ahead to forge closer relationships with companies. Ultimately, Partners executives said, the goal is not just to generate revenue, but to advance health care. can be reached at priyanka.mccluskey@globe.com. Follow her on Twitter @priyanka_dayal.